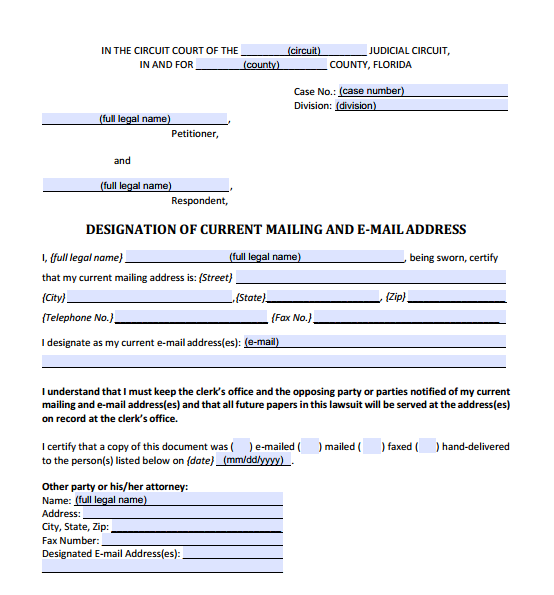 PDF Fillable Form 12.915 Designation of Current Mailing and E-mail Address. This form should be used to inform the clerk and the other party of your current mailing and e-mail address(es) or any change of address. It is very important that the court and the other party in your case have your correct address. A party not represented by an attorney may choose to designate e-mail address(es) for service. If there is any change in your mailing or e-mail address(es), you must complete a new form, file it with the clerk, and serve a copy on any other party or parties in your case.